These posts were a collaborative effort by staff in the Barbara Goldsmith Preservation and Conservation Department and University Archives. Reporting by Carmel Curtis, Kimberly Tarr, Emily Nabasny, Celeste Brewer, and Janet Bunde. View Part 1 and Part 2 in the series. There is a wealth of footage from games at both Yankee Stadium and Madison Square Garden when NYU played teams such as Notre Dame, Duke, Fordham, Hobart, Georgetown, Colgate, Lafayette, and Dartmouth. Additionally, there is footage from a 1948 basketball game featuring NYU vs. Fordham at the 69th Regiment Armory. 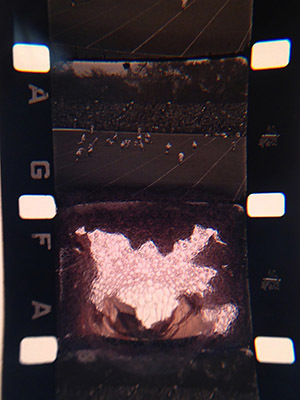 A few frames from a damaged 16mm film featuring a 1932 football game (NYU vs. Hobart) that has projection damage, resulting in bubbled and melted frames. As part of NYU Moving Image Archiving and Preservation student Emily Nabasny’s 2014 thesis, the sports films were inspected and re-housed with the assistance of Carmel Curtis and Pamela Vizner Oyarce in the Preservation Department of NYU Libraries, under the supervision of Kimberly Tarr and Benjamin Moskowitz. (2) Each film was wound onto a 3-inch inert plastic core, inspected for tears and signs of degradation, re-housed in vented inert plastic cans, and placed in the climate-controlled media vault. Repairs to poor splices and tears were made where necessary and possible. Many of the films showed significant damage from improper care and handling, due to the frequent use of the films for post-game review. Many of the materials in this collection were accompanied by minimal descriptive information, often found scrawled on the can. The content of these films was generally described as “football,” “basketball,” or “athletics,” and occasionally noted the school against which NYU was competing. However, even this minimal amount of information was not always noted. Through inspection of the film, some descriptive metadata was determined — oftentimes when shots of scoreboards were caught on film or intertitles were added. Additional descriptive information came from documents (especially schedules and programs) in the Records of the Athletics Department (RG 41), also located in the University Archives. A selection of films from this collection were recently digitized by the Los Angeles-based film laboratory, Reflex Technologies. Reflex generously donated their services to NYU Libraries, enabling the preservation of these unique films. We are delighted to share these excerpts, which have not been viewed in decades! We hope you enjoy these clips. Excerpts are available here. Content: A film containing game footage of two games played at Yankee Stadium. Features: a marching band, intertitles detailing action, Scoreboard: NYU – 13 Visitor (Butler) – 6, Scoreboard: NYU – 7 Visitor (Penn State) – 0. One of the oldest films in the collection. Research Value: Dave Myers, one of the earliest African-American players at NYU, served as quarterback for the Butler game (which was on played October 26, 1929). (3) Myers went on to play in the NFL (for the Staten Island Stapletons and the Brooklyn Dodgers, where he overlapped with Jerry Nemecek) and, possibly, in an independent African-American football league. The coach, Chick Meehan, has been inducted into the NYU Athletics Hall of Fame. According to documentation shared by Brian Richards, curator of the New York Yankees Museum, NYU and Penn State played on October 19, 1929, at Yankee Stadium. Attendance was approximately 30,000. 7-0, NYU, was the final score. NYU and Butler played on October 26, 1929, at Yankee Stadium. Attendance was approximately 25,000. 13-6, NYU, was the final score. Research Value: The 69th Regiment Armory, an historic building located in Manhattan, was declared a National Historic Landmark in 1965 and a New York City landmark in 1983. Its 5,000 seat arena is used for sporting and entertainment events. In addition, the coach (Howard Cann) and several players (Don Forman, Ray Lumpp, Dolph Schayes, and Thomas Kelly) were inducted into the NYU Athletics Hall of Fame. All four players–Forman (Minneapolis Lakers), Lumpp (New York Knicks, Indianapolis Jets, Baltimore Bullets), Schayes (Syracuse Nationals and the Philadelphia 76ers), and Kelly (Boston Celtics)–went on to professional careers in basketball. Schayes also coached the Philadelphia 76ers in 1964-1966. In the 1948 season, the NYU Violets had a 20-3 record, were ranked 6th nationally, and earned a berth in the NIT. Ray Lumpp is also an Olympic gold medal winner; he played on the winning men’s basketball team in 1948. Research Value: The coach (Lou Rossini) and players Harold “Happy” Hairston and Barry Kramer were inducted into the NYU Athletics Hall of Fame. Hairston (Cincinnati Royals, Detroit Pistons, L.A. Lakers) and Kramer (San Francisco Warriors, New York Knicks, as well as the ABA’s New York Nets) both went on to play in the NBA. Harold “Happy” Hairston played at NYU from 1962-1964; Mark Reiner was named NYU Player of the Year in 1961. (1) “The Muse: Ed Smith,” Sports Illustrated. December 5, 1988. (2) Some information presented in this post was culled from the thesis “Keep the Ball Rolling! A Look Into the Archiving and Preserving of Sports Films in Universities” by Emily Nabasny in fulfillment of her Master’s of Arts in Moving Image Archiving and Preservation (MIAP). (3) See “N.Y.U. Turns Back Butler Eleven, 13-6.” New York Times. 27 October 1929.